You can record audio and video from a stream, and control the recording process through various settings. With the stream recorder, live audio and video can be kept on your target. You must create a media packet for the stream recording using raw data from the source. The media packet must be created for each buffer captured from the source and passed to the PushBuffer() method of the Tizen.Multimedia.StreamRecorder class. You can record a stream, pause, stop, and cancel the recording, and push the buffer. The supported file formats are defined in the Tizen.Multimedia.RecorderFileFormat enumeration. You can use various video and audio encoders. The available video and audio codecs are defined in the Tizen.Multimedia.RecorderVideoCodec and Tizen.Multimedia.RecorderAudioCodec enumerations. Valid input sources consist of external sources, such as a live buffer passed by the application. Most operations of the stream recorder work synchronously. The following figure illustrates general stream recorder state changes. Use the stream recorder methods according to pre and post conditions, by following the state changes. You can check which file formats the device supports using the GetSupportedFileFormats() method of the Tizen.Multimedia.StreamRecorder class. Note Even if a higher bitrate is set, the recording bitrate is limited by that of the stream buffer pushed. Similarly, to record an audio stream, define the audio recording options in the Audio property of the StreamRecorderOptions class instance, using an instance of the Tizen.Multimedia.StreamRecorderAudioOptions class. The media packet must be created for each buffer captured from the source and passed to the PushBuffer() method of the Tizen.Multimedia.StreamRecorder class when the stream recorder is prepared to record. The stream recorder state changes to Ready. Once the recording starts, if you set the file path to an existing file, the file is removed automatically and replaced with a new one. You can only call the Start() method in the Ready or Paused state. After starting, the state changes to Recording. The stream recorder state changes from Recording to Paused. To resume recording, use the Start() method. Alternatively, you can stop pushing the stream buffers. In this case, the stream recorder remains in the Recording state, and continues waiting for buffers. It creates the same effect as a pause in the recording. To stop recording and save the result, use the Commit() method. The recording result is saved to the file path defined in the Tizen.Multimedia.StreamRecorderOptions instance. 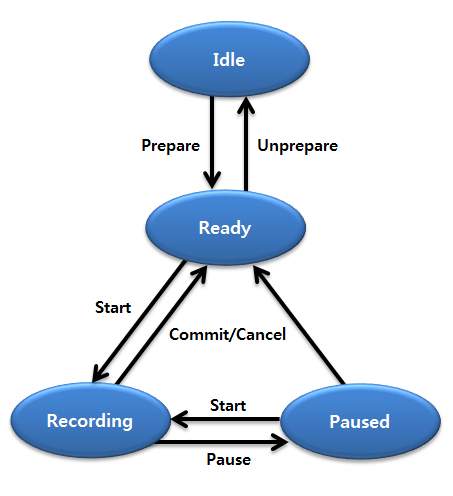 You can only call the Start() method in the Recording or Paused state. After committing, the state changes to Ready. To stop recording without saving the result, use the Cancel() method. The only difference between this method and the Commit() method is that the recording data is not written to the file. The stream recorder state changes from Ready to Idle.